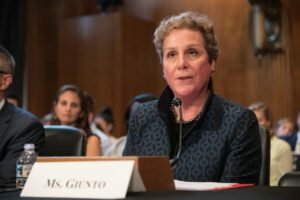 SEATTLE – Nancy Giunto, Executive Director of the Washington Health Alliance, was invited to provide testimony Tuesday, September 18, 2018 before the US Senate Committee on Health; Education; Labor; and Pensions (HELP) about efforts to reduce costs and improve the quality and value of health care. “Reducing Health Care Costs: Examining How Transparency Can Lower Spending and Empower Patients” is the fourth in a five-part series of HELP Committee hearings overseen by Washington State Senator Patty Murray, Ranking Member, and Senator Lamar Alexander, Chairman from Tennessee. “Since 2004, the Washington Health Alliance has been committed to bringing together the most reliable data on health care quality and value in our state to help payers, providers, purchasers, and patients make better health care decisions. We are honored that the HELP committee has recognized us as leaders in advocating for transparency to help lower the cost of care,” says Giunto. “However, we could not have arrived at this place without the hard work of our Board of Directors, Alliance members and stakeholders across the state who continue to collaborate to find solutions on how to improve health care value – cost, quality and patient experience,” she adds. As Congress and health care leaders work to find solutions to the affordability crisis, there has been a recent groundswell in making hospital cost and quality data available to consumers, and a recognition that transparency is essential to lowering health care costs. Last month, a new ruling by the Centers for Medicare and Medicaid Services mandated that hospitals post their charges online for public access. The Alliance’s “Community Checkup” and “First Do No Harm” reports, which provide transparent data on cost and quality to the public, have caught the attention of national media as well as politicians at the local, state and national level. Giunto is one of four expert witnesses from across the US invited to provide expertise and experience on efforts to reduce health care costs by examining how transparency can lower spending and empower patients. King County Executive Dow Constantine will be testifying at the final hearing the following week on improving affordability through innovation.